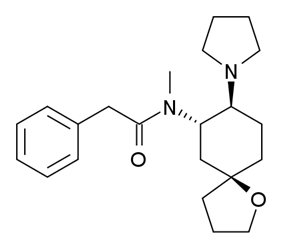 U-69,593 is a drug which acts as a potent and selective κ1-opioid receptor agonist. In animal studies it has been shown to produce antinociception, anti-inflammation, anxiolysis (at low doses), respiratory depression, and diuresis, while having little effect on gastrointestinal motility. It also inhibits the peripheral, though not central secretion of oxytocin and vasopressin in rats. ^ a b c La Regina A, Petrillo P, Sbacchi M, Tavani A (1988). "Interaction of U-69,593 with mu-, alpha- and kappa-opioid binding sites and its analgesic and intestinal effects in rats". Life Sciences 42 (3): 293–301. ^ Frey HH (March 1988). "Effect of mu- and kappa-opioid agonists on the electroconvulsive seizure threshold in mice and antagonism by naloxone and MR 2266". Pharmacology & Toxicology 62 (3): 150–4. ^ Zukin RS, Eghbali M, Olive D, Unterwald EM, Tempel A (June 1988). "Characterization and visualization of rat and guinea pig brain kappa opioid receptors: evidence for kappa 1 and kappa 2 opioid receptors". Proceedings of the National Academy of Sciences of the United States of America 85 (11): 4061–5. ^ Millan MJ, Członkowski A, Lipkowski A, Herz A (October 1989). "Kappa-opioid receptor-mediated antinociception in the rat. II. Supraspinal in addition to spinal sites of action". The Journal of Pharmacology and Experimental Therapeutics 251 (1): 342–50. ^ a b France CP, Medzihradsky F, Woods JH (January 1994). "Comparison of kappa opioids in rhesus monkeys: behavioral effects and receptor binding affinities". The Journal of Pharmacology and Experimental Therapeutics 268 (1): 47–58. ^ Binder W, Machelska H, Mousa S, et al. (June 2001). "Analgesic and antiinflammatory effects of two novel kappa-opioid peptides". Anesthesiology 94 (6): 1034–44. ^ Privette TH, Terrian DM (April 1995). "Kappa opioid agonists produce anxiolytic-like behavior on the elevated plus-maze". Psychopharmacology 118 (4): 444–50. ^ Wall PM, Messier C (February 2000). "U-69,593 microinjection in the infralimbic cortex reduces anxiety and enhances spontaneous alternation memory in mice". Brain Research 856 (1–2): 259–80. ^ Wall PM, Messier C (May 2000). "Concurrent modulation of anxiety and memory". Behavioural Brain Research 109 (2): 229–41. ^ Soulard CD, Guerif S, Payne A, Dahl SG (December 1996). "Differential effects of fedotozine compared to other kappa agonists on diuresis in rats". The Journal of Pharmacology and Experimental Therapeutics 279 (3): 1379–85. ^ Van de Heijning BJ, Koekkoek-Van den Herik I, Van Wimersma Greidanus TB (December 1991). "The opioid receptor subtypes mu and kappa, but not delta, are involved in the control of the vasopressin and oxytocin release in the rat". European Journal of Pharmacology 209 (3): 199–206. ^ Melis MR, Stancampiano R, Gessa GL, Argiolas A (January 1992). "Prevention by morphine of apomorphine- and oxytocin-induced penile erection and yawning: site of action in the brain". Neuropsychopharmacology 6 (1): 17–21.